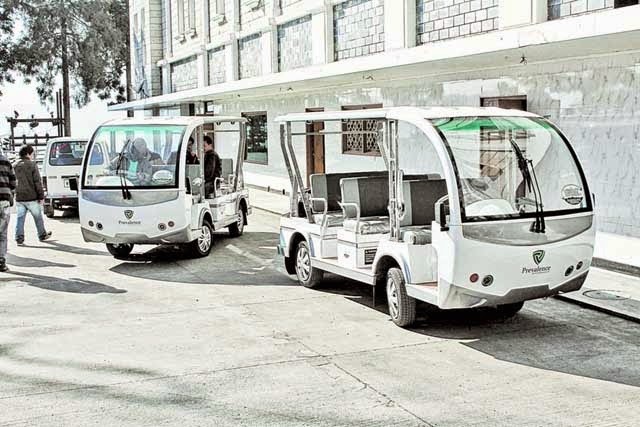 Three battery powered cars were introduced in Darjeeling on Friday by the Gorkhaland Territorial Administration (GTA) to operate from the Mall to the Darjeeling zoo which are two kms apart. The initiative is part of the effort of the council to provide tourists visiting the Hill station with new attraction during their stay. Gurung, the GTA chief executive, at the start of the launch of the service from today from Bhanu Bhawan. covering a radius of 10 to 15 km,” said Gurung. Initially the idea behind brining the cars were to provide some sort of travelling options for the aged and differently-abled persons who walk through the Mall to reach their homes and offices or for leisure. However, now the service has been extended to the tourists who walk from Chowrastha, the Hill’s popular promenade to the Darjeeling zoo. The GTA has decided to operate the battery cars (eight-seater each) in two stretches. The first will be from the Gorkha Ranga Manch Bhawan to the Darjeeling zoo. And the other from Gorkha Ranga Manch Bhawan to Mahakal Mandir which is the most revered place in the Hills. One can also reserve the vehicles if they want. The vehicles brought at the cost of Rs.11.50 lakhs each, once fully charged for a little over three hours will be able to travel for nearly 60 kms. The rates for the rides have also been fixed by the GTA’s transport department. A ride from Bhanu Bhawan to the Darjeeling zoo and back, the service time from 10 am to 4 pm will cost Rs.20 for each person, which will also be the same for the service to the Mahakal Mandir. However, for reserved service from Bhanu Bhawan to the zoo, it will cost Rs.500 and to the Mahakal Mandir Rs. 120. However, the Mahakal Mandir service will be available only from 7 am to 10 am. The charges for the in and around Dello surrounding area ride will cost passengers anything from Rs.50 to 100 per head depending on the distance to be travelled. Three battery powered cars were introduced on Friday by the Gorkhaland Territorial Administration (GTA) to operate from the Mall to the Darjeeling zoo which are two kms apart.